… J. J. Perry delivers a complex, challenging and thought-provoking book that explores inner as well as outer space. Readers will find many rewards here. Author J J Perry has released his new a non-fantasy, science fiction epic “REAP 23” that sweeps readers up on a journey through space and time spanning 9,000 years and centers on a future religious cult that honors dozens of astronauts who set out to find and populate planets several millennia in the past. The Repopulation, Expansion and Annexation Program (REAP) was designed to send one-way missions to 25 potentially habitable moons or planets within 5,000 light years of earth. 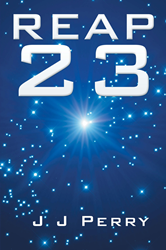 After a bunker containing devices intended to receive messages from each of the missions is rediscovered despite being buried during an ice age, explorers learn that at least one mission, REAP 23, was successful. Chronicling the four REAP 23 couples’ experiences undergoing ultra-hibernation and facing the chance they will arrive at a destination unsuitable for habitation after their long journey, “REAP 23” details the stresses and conflicts of the crew at both ends of its millennia-long trip as well as the discovery of their message and attempt to reconnect with humanity. J J Perry is a practicing cardiologist and earned a bachelor’s degree in chemistry and a medical degree from the University of Utah. Perry previously built and managed the largest cardiology practice in the western U.S., has been licensed and practiced cardiology in more than 10 states since 2002 and is listed as an author for a couple dozen professional research papers. When he was young, Perry’s dream was to write science-based, non-fantasy screenplays, and in his early academic career, he majored briefly in theater before transitioning to physics, chemistry and, ultimately, medicine. Perry is also the author of “Between Love and Money,” which he self-published in 2007 under the pen name Martin Filson, and he currently has four other manuscripts in the works. He currently resides in Millcreek, Utah. To learn more, please visit http://www.jj-perrynovels.com or view a trailer for the book here.